Reading back through Eastman and Laird's Teenage Mutant Ninja Turtles #37, I am reminded of why I used to like the ninja turtles as a kid. Not only are they a bunch of weapon wielding mutants, they are also entertaining bickering brothers. The four turtles give each other a hard time while still coming together and supporting their shelled family. Early on in Teenage Mutant Ninja Turtles #37, the brothers make fun of Donatello, yet later they are only concerned with the safety of their brothers. With Splinter at the head of the table, the turtles are a family just like any other...except more evil fighting and sewer dwelling. The comic of the day is apart of the classic Eastman and Laird run. Did you know the first issue is estimated to be worth about $1,400? That's about a dollar for every time I saw the first Ninja Turtle movie. Eastman and Laird's run brings back feeling of the early turtle days, not just through the stories such as issue 37's adventure in a forest where the turtles bond on a spiritual journey by slaying a huge rat of the non Splinter variety, but because the art is all in black and white. The only things in black and white are things from the past, zebras, Michael Jackson's career (zing). 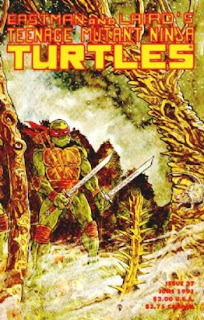 After I re-watch the first Ninja Turtles movie I think I may dig for some old Eastman and Laird's issues of my favorite heroes in a half shell.